When you think about Australia and more specifically when you think about Australians… what is the first thing that comes to your mind? I mean as a stereotype, as a cliché?! Before I moved to Australia, I thought that Aussies were all surfers and crazy about surfing mostly… that was THE thing! 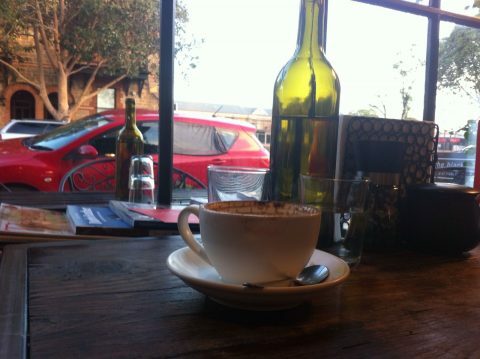 But then I moved to Adelaide and I realised that one of the most important thing for Australians is actually…. 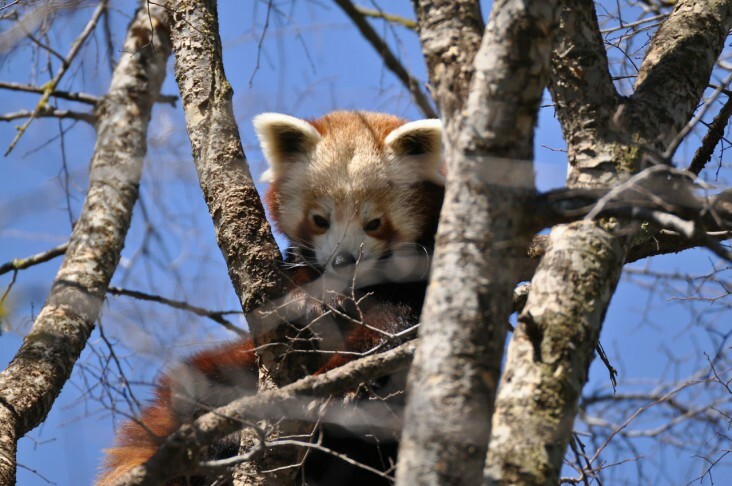 wait for it…. COFFEE! They drink a LOT of coffee… and forget about Starbucks, because here it is not just about the coffee, but also about the cute little place where you enjoy your latte, the friendly and talented barista who knows you well and the vibes and atmosphere! 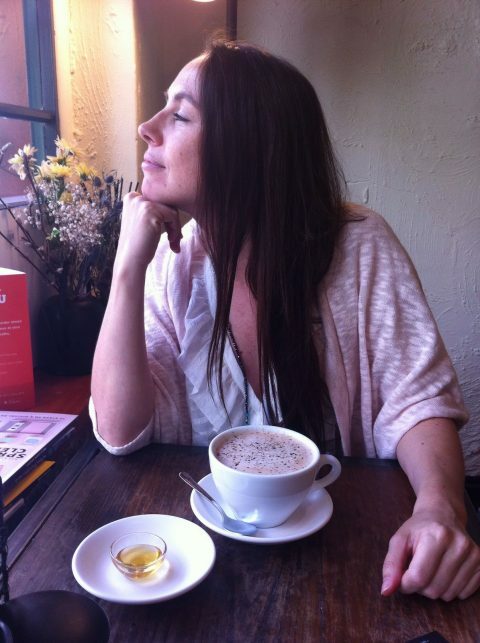 For those who know me… I know what you’re thinking… V you don’t even drink coffee, what are you talking about?! Well I am a Chai Latte lover… so generally where there is good coffee, there is a good barista and de facto there is a good Chai, it is as simple as that 😉 And you know me, I like to discover new cafés and to blog about it… I have always this crazy fantasy that I am going to have my local café where I am going to be a regular… Long story short : a bit like the Girlmore GirlsTV show with “Luke’s dinner” except that Lorelai did the mistake to date Luke, big time, and then they broke up so it was very awkward she could not go there for a while and she was really missing the coffee, hugeeeeeee mistake (lol, that was a wink for the TV show fans). I know that some of you cried a river when the very hipster Tin Cat Café closed but maybe this will cheer you up if I tell you that a new tenant has taken over : The black addition. 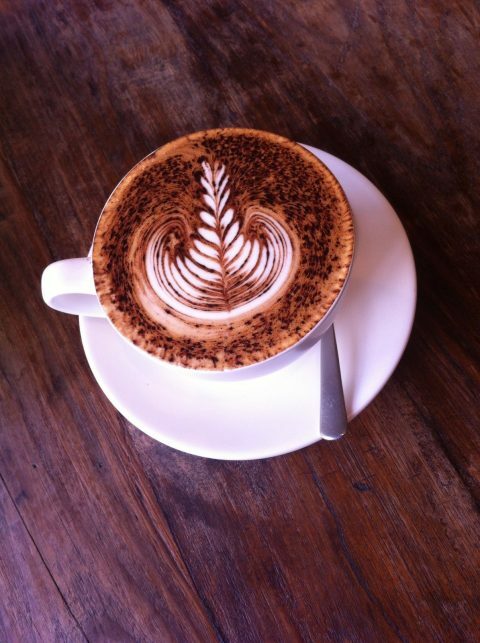 Sounds promising for coffee lovers, isn’t it?! And this is quite an interesting story since it was formerly a mobile coffee business which was pretty successful on the road…on various private and corporate events… so busy that they were hard to catch… it is like when the fun fair arrives in town and you have all those colours, those lovely smells and you just follow the music hoping not to miss the show! Actually they were so successful that some fans even made the secret wish that someday the 2 owners would settle down so it would be easier to find them and enjoy one of their delicious coffees and this wish came true! So at the moment, they are operating in the former Tin Cat Café in Kent Town. The two lovely owners Alison and Sean (a couple) are experts in the latte art and even host Barista classes in their lovely little café! I had a Chaï Latte and it was absolutely delicious with coconut milk and it tasted different from what I am used to and I really enjoyed it! As for the coffee, because I wanted to give a fair review, I went to this place with my coffee expert friend : the lovely Jessica from Mexico (and god this girl lovesssss coffee and can be fussy about it lol) and she really enjoyed it, she said it was sensational! Going to Central Market with my bike on Saturdays is the best! 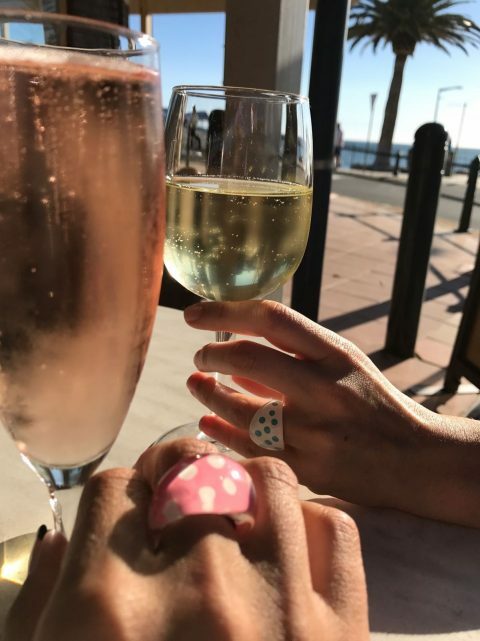 Sharing a glass with my friend Sybilla at Brighton beach! I believe that when you have the chance to live in a such beautiful city as Adelaide, you should enjoy the landscapes, feeling free with the wind in your hair driving along the beach in an old vintage car or a motorcycle, stopping at a terrasse for a glass of wine while gazing at the sunset on the jetty… There is something romantic about vintage transportation, la dolce vita, as they say in Italy… this is actually how I picture it. 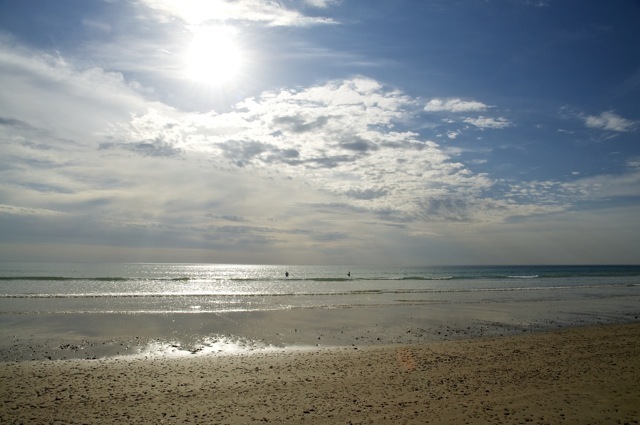 And I believe Adelaide is the perfect spot to enjoy life and take your time to seize the day. I think sometimes we are so used to the place where we live, we are so stuck in our own routine that we don’t acknowledge anymore the beauty of it, we don’t pay attention to what is beautiful and unique, we don’t feel enough grateful for what we have… and maybe this is the beauty about being a foreigner because you still have this fresh outlook on your country and culture of adoption and you keep being surprised and amazed by your everyday life. OULALA !!!! Gigi and I were meant to be! Sybilla and I being both crazy about GIGI! 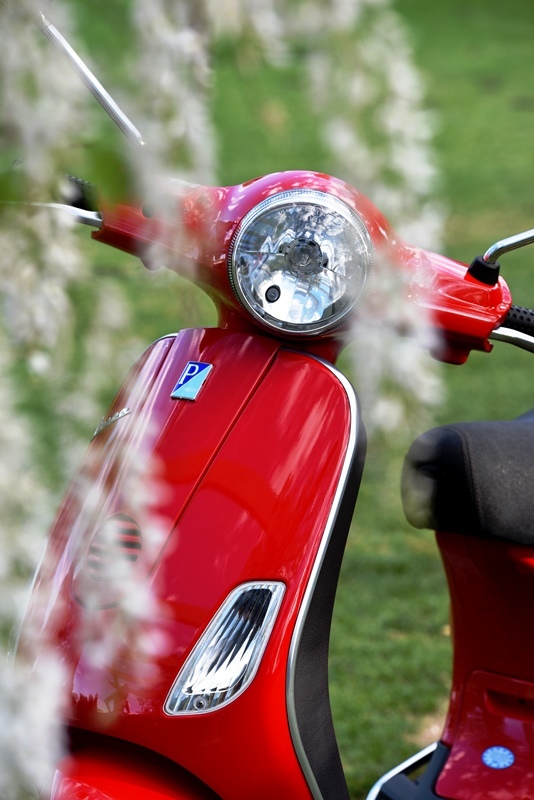 So to Vespa or not to Vespa… this is the question… what do you think?! Shall I find Zoé (that’s how I call my bike) a new friend? 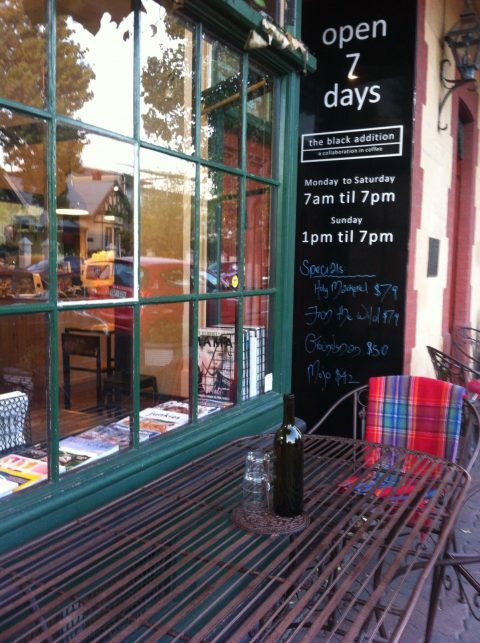 So I can keep exploring and blogging even more about Adelaide and its surroundings! When I was living in Paris, many people would talk to me about the benefits of practising yoga. Life in a big city can be stressful between your job, the commute, busy people and so little time to enjoy life. I was curious about it and I thought maybe I should try and see by myself how it feels. So I enrolled to a class and it was good but I did not connect with it and I stopped after a few sessions. Some of my friends were surprised as they really believed that it would fit with my personality but sometimes all it takes is to meet the right person. And it happened… with patience… many years after in another country actually. Life, work and opportunities took me to London (UK) for a year and this is where I met the most amazing yoga teacher you can imagine. And have you also noticed that often the best things that happen to you in life, are very often the ones that you were not looking for. It is like sometimes, life has little gifts for you. And this is what happened to me with Mieke 🙂 at that time I was really not thinking about yoga or anything and I found a card in my letter box and I was about to throw it directly in the bin, but some words caught my attention because I could relate to them. And this is how I started yoga sessions, 5 times a week with the adorable Mieke. And you can’t imagine how much it helped me at a time I needed it the most in my life. At the beginning I remember it was challenging because it was in English and I did not know the names of the postures etc… but then I got used to (watching her mainly and associating images with words) and now I can’t imagine yoga in another language than English, funny isn’t it? My family name is related to nature and more specifically to trees… so this posture was made for me 😉 even if I am a very tiny and not very flexible tree lol I can bend but I won’t break! Now that I am living in Australia, I still practise sometimes yoga on my own thanks to internet and when I find the time to do so. It is a very calming and grounding activity that I highly recommend. 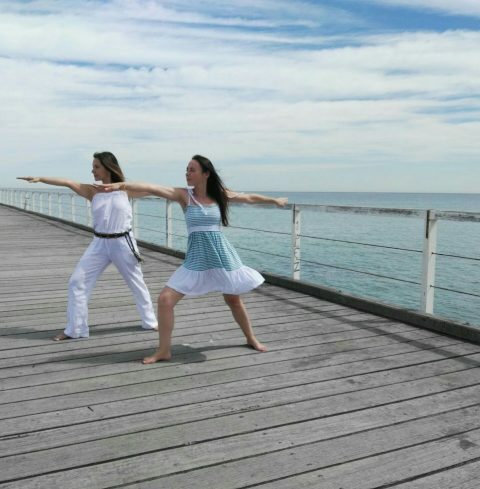 Besides I must say that with this beautiful weather I had the opportunity to go and practise yoga at the beach and it was a great experience with all these beautiful colours, the sound of the waves rolling on the beach and this beautiful sun in this vibrant blue sky. It was like a dream and practising yoga in such a beautiful setting made me feel very grateful. Besides I had the opportunity to teach some postures to some of my friends (Jessica from Mexico and Liliana from Venezuela) and they really enjoyed it! 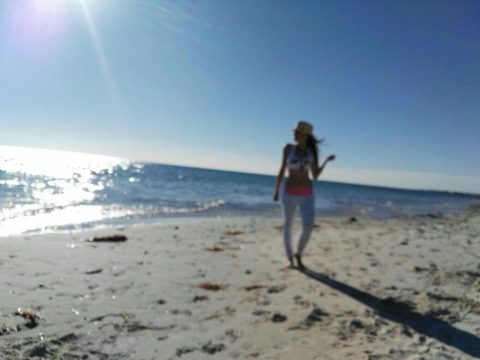 It is a good way to feel connected with earth and feel your stress leaving you as you are embracing yoga with all of your heart, letting go, no where to go, no where to be, just in the present moment! 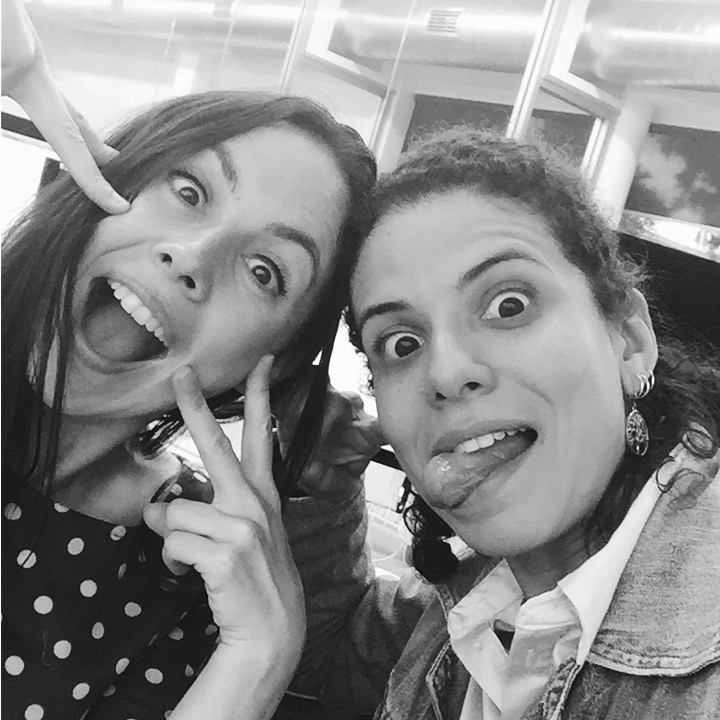 My friend Jessica (Mexico) often says that people come to your life for a specific reason. Sometimes it is to teach you something about life or yourself, sometimes it is to bring you love and kindness, sometimes to challenge you… and you have to embrace this feeling! There will be sometimes, when living abroad, when you will feel frustrated, like nothing is working the way you want and you don’t really understand why because you are trying your best. It is a strange feeling that many foreigners experience because we are far away from our country, our culture, our family… and everything is new and different. The key is to learn to adapt as quickly as possible which is not always easy. But you can’t do this alone, you have to surround yourself with true friends. Friends who will become your second family, friends you choose because they are “like” you, friends who will show you the way when you are lost, friends who will be there for you no matter what. These people will make a big difference not just in your day but also in your life and you will do the same for them too, sometimes without even realising it! I recall once I had a “perfect” day with my friend Liliana (Venezuela) and it felt really nice. 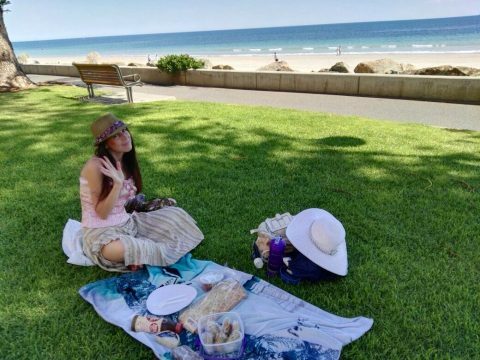 We did not do anything “spectacular”, we were just 2 girls sharing a nice picnic together, taking pictures/selfies, enjoying a good conversation! But it was sooooo good. Sometimes you think that you need complicated things to be happy and you can feel frustrated thinking that it is going to be hard to get them but thinking of it most of the time it is the simplest things that make you really happy. Think of it, try to remember when was the last time you really felt happy and I am sure you are going to realise that it was something very simple. When France meets Brazil, it’s crazyyyyyyyyyyy! My Brazilian friend and I, partners in laughing crime. It can be a smile, a compliment, a nice walk, something nice to eat, a beautiful bird passing by… you don’t need your day to be perfect to feel it is perfect, you just need to collect moments, those who make a difference in the rest of your day and will accompany you the rest of your week. And sometimes, total strangers will make a difference too without knowing it, just because they are genuinely nice and friendly when you need it the most. Let’s go to the jetty! 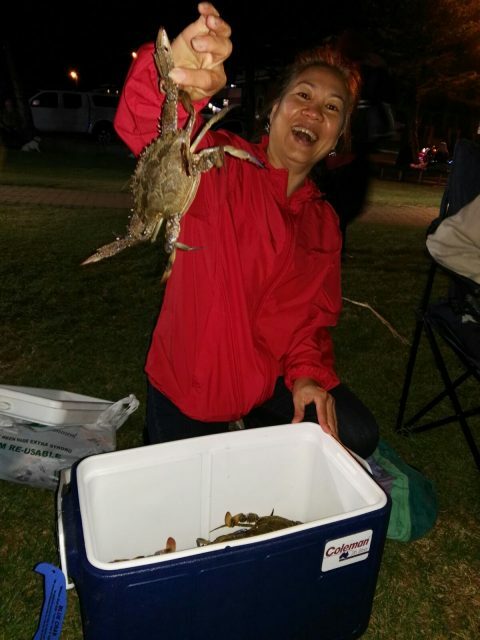 Last Friday, Kim (Vietnam) came up with the perfect and most original idea: “Let’s go crabbing at sunset”, she said! It is something that none of us have experienced before. We thought, yes sure, why not, let’s give it a try! 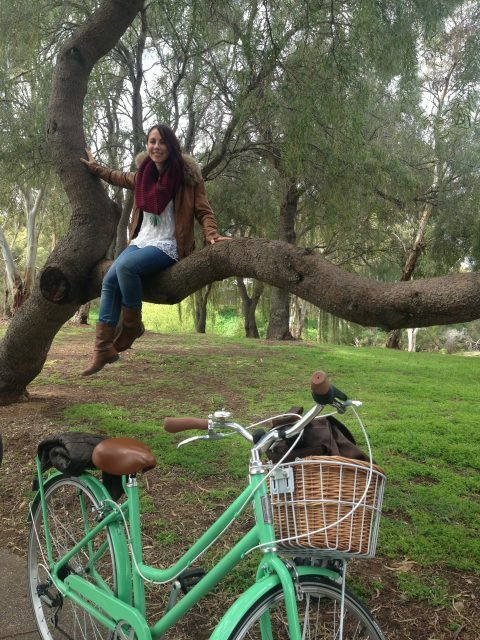 Jessica (Mexico) believes that each week we should do something totally new in order to embrace our new Australian lifestyle and make some good memories. Sometimes it feels like your own private desert island! I must confess I was a bit confused about the technique and was picturing myself running on Semaphore beach, lifting (small) rocks and chasing (or being chased) by crabs and running even faster should this happen to me! I thought, yes well, worst case scenario I would enjoy the beach and maybe even an ice cream. 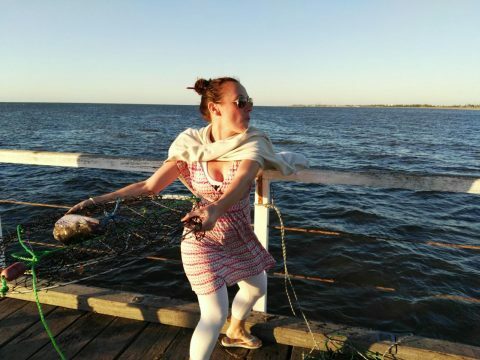 But actually, I was wrong, crabbing is easier than I thought, all you need is a jetty, a bucket to hold your catch, a fishing basket with line and a little bait to attract crabs such as fish heads… mmm I know yummy! Like fishing, it requires some patience, so the best way to make the time flying by is to enjoy this activity with some crazy and lively friends! So lucky to be surrounded by my international friends! Our friend Kim (Vietnam) was the best instructor ever. She gave us many instructions how to throw the fishing basket far far away. You need to keep if flat and be careful with the strings attached to it because you don’t want to end in the sea with it eaten by the crabs. Three, two, one, GO and fly away! Thank god, I have been working out lately and it shows! 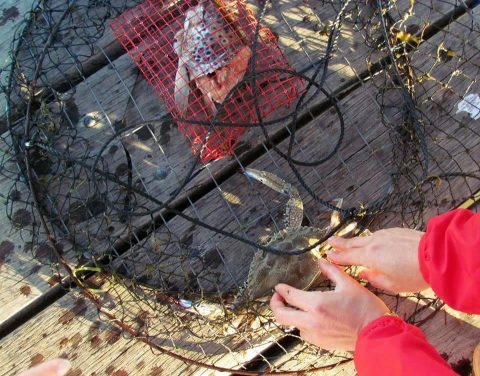 We were pretty successful and we managed to catch something like 12 crabs. Actually we caught more but we had to release the little ones. Everybody was super happy and Peggy’s kids (Taiwan) were so proud and they had so much fun. It is definitely a good idea for a family/friends activity. Summer time can be so hot in Australia, sometimes the temperature is so high that sleeping at night becomes nearly impossible despite a good air con. Some people prefer instead to spend the evening until late at night on the jetty crabbing. There is a cold breeze coming from the sea and as the sun is disappearing the temperature is dropping. Actually I recommend to bring sweaters, socks, trainers as it can get pretty cold on the jetty… As it was a first time, many of us did the mistake to come in their beach gears, not the best idea especially at sun set, it was “freezing”! But the fun did not stop there. 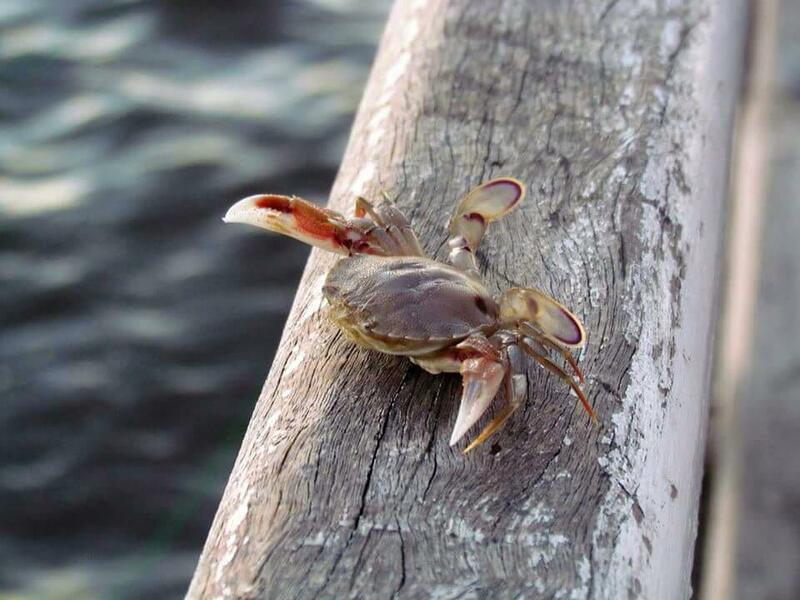 Crabbing is something and eating crabs is something else! And the party went on at Kim’s house. 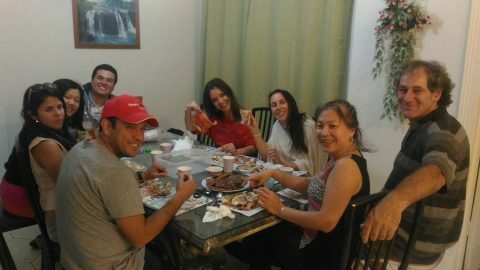 She invited us in her beautiful home and taught us how to cook the crabs. She also made some delicious sauce to go with. It was fun, because we learnt how to eat a crab, breaking it in small pieces and sucking the flesh out of it… does it sound like a zombie/vampire thing?! I must say it was delicious and we all enjoyed it very much and we can’t wait to go again crabbing! 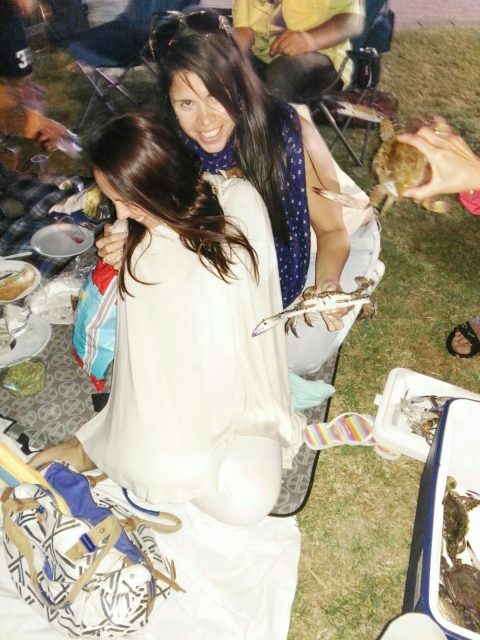 I would have never imagined that eating crabs that I caught could be so much fun! When Spring looks like a French Autumn, the only thing you can do is put a hat on, grab your bestie and chill out with a latte! 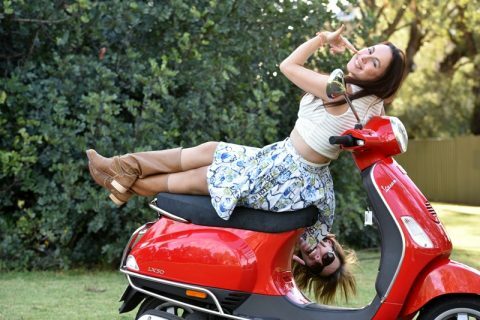 Nasim (from Iran) and I are always on the same page when it comes to enjoy life at its best! Spring has been so lazy to come this year. We experienced a lot of morning showers, grey sky, wind and some severe storms in September and October. In one hand, it was a bit depressing + there was a “major” water leaking in my house (one morning I woke up and water was coming from the ceiling, click here for the full story) but in the other hand, it is really good for mother nature because the trees and flowers look amazing right now with beautiful deep and lively colours. I guess you can’t have it all! 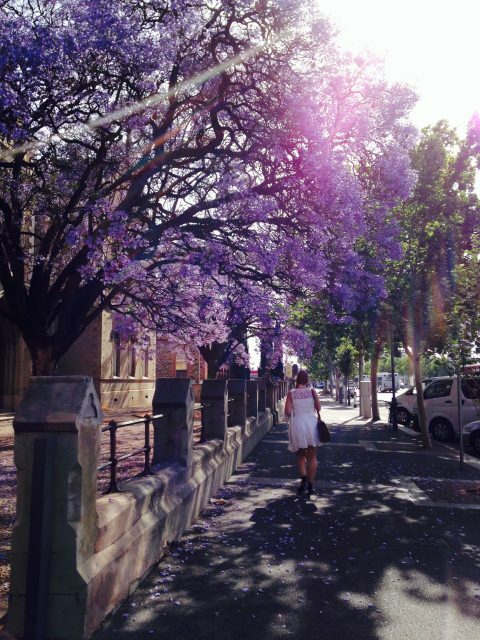 A romantic vision of a young girl with a white dress walking on the Jacarandas’petals on a sunny spring day. Maybe you will think I am a fool but one thing I was really expecting was to see the Jacarandas blooming! They are my favourite trees and their romantic purple flowers appear the first weeks of November announcing that spring is here and summer is only a month away. This year, because of the strange weather, the Jacarandas only started now to spread their vibrant colours in the whole city. Their mauve flowers petals are falling on the pavement like confettis and it brings a “je ne sais quoi” to the streets of Adelaide. Someday when I will own a house with a garden I will plant a Jacaranda tree to gaze at it! Just try it and tell me in the comments below how it felt! Sometimes I have crazy ideas and luckily for me I have always awesome friends to follow me in my euphoric projects. 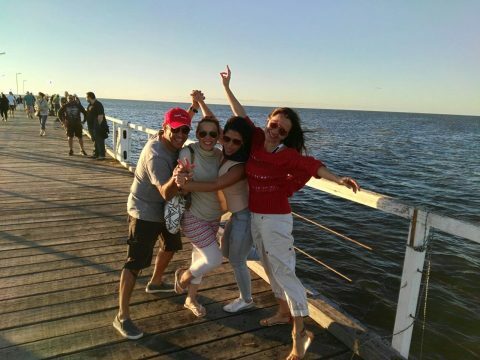 So it is no surprise that when I decided to go to Henley Beach by bike to celebrate my birthday, my friend Nasim (from Iran) was part of it! For those who have been following me and paying attention, last year, for my birthday I got a beautiful green bike that became my fav. 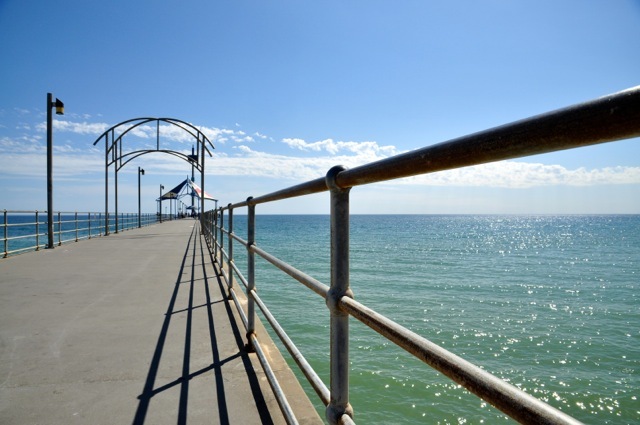 transportation mode to go to work, school, activities, market etc… So it makes sense that this year I wanted to take it to the next level and go on a bike trip from Adelaide CBD to the beautiful Henley beach. Adelaide’s parks are full of surprises. Look at this party setting with permanent balloons floating all around! Happy birthday to me I guess! 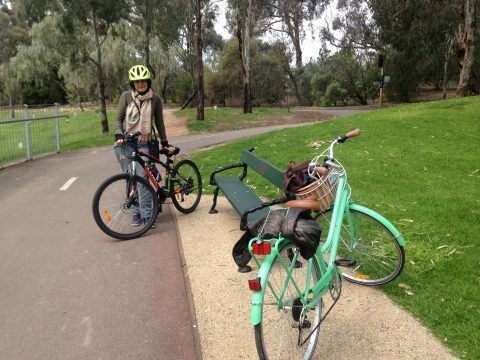 The river Torrens Linear trail is known to be pretty easy, flat and scenic. 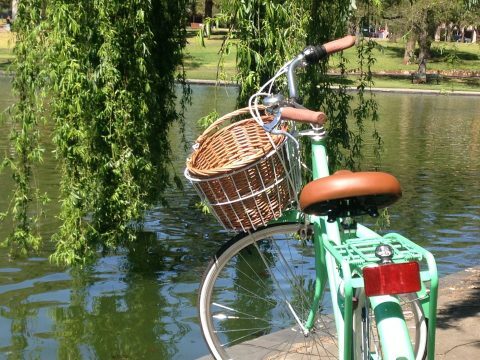 Imagine yourself biking along the river, in the parks, with the beautiful and majestic trees swaying in the breeze, the enchanting colourful birds singing along the way (have you ever heard a Cockatoo?! not very melodious lol) and the nature surrounding you like a comforting cup of tea on a Sunday morning. I really believe, this is worth giving it a try and we are so lucky to have many bike trails here in Adelaide. It is a good way to discover a city and its surroundings. 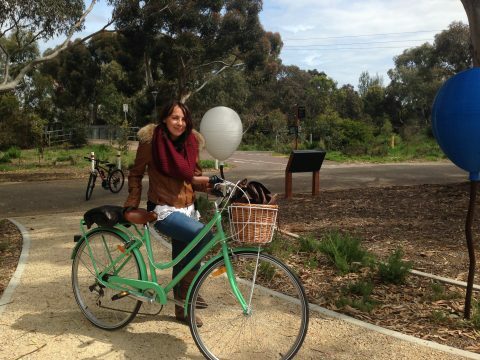 Besides it is very easy to rent a City Bike in Adelaide for free, so no excuse! Nasim and I met first at San Churro for breakfast. I guess we both needed a good dose of sugar to boost our bodies before hitting the road. 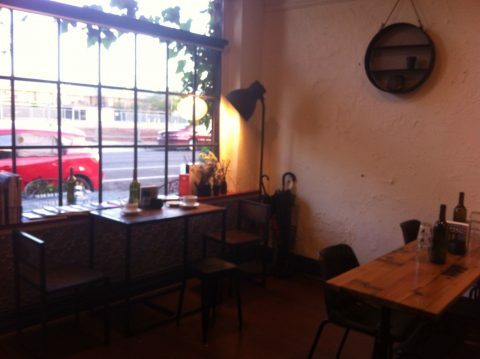 At the beginning, everything was really nice and we really enjoyed it. Nasim was even considering buying a new bike to do that more often. I mean it is an healthy and fun way to exercice. We stopped many times to take funny pictures, to gaze at the landscapes, to relax… But what I did not consider is that even if this trail is said to be easy, it is quite long and you need at least a bit of practice. 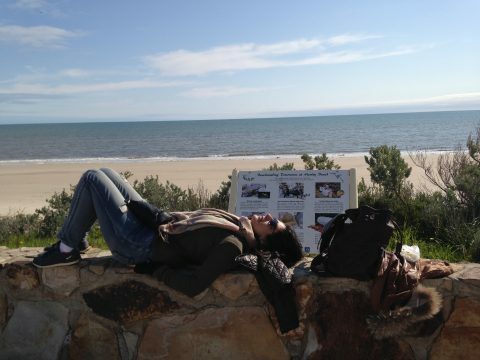 So basically I think it took us about 3 hours (maybe more) from the CBD to reach Henley Beach. When we arrived there, I think Nasim was about to collapse. 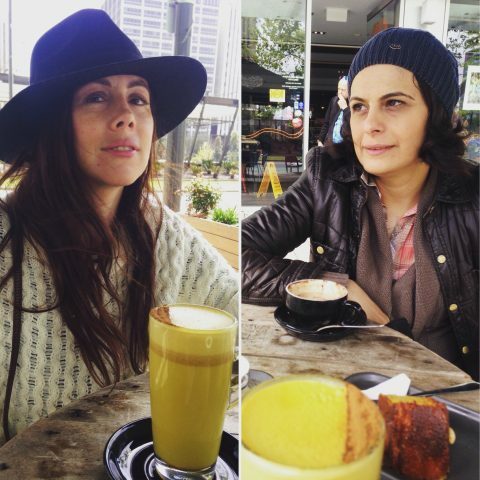 I think at this stage, Nasim had enough… this pic was taken sometimes between her collapsing and then having lunch. 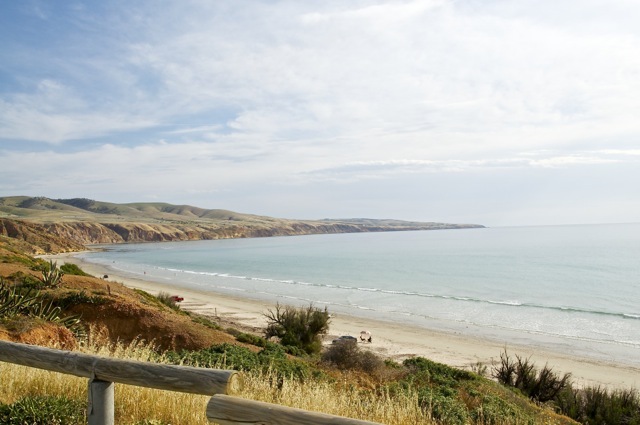 Adelaide and its surroundings are so beautiful. Sometimes I can’t believe I live here! As we started to make our way back, it appeared that Nasim had no more juice. Her body hurt, she was not feeling well and soon riding her bike became a nightmare. We tried many things, we switched our bikes, I encouraged her… but when the body shuts down, there is nothing that can be really done. And sadly for Nasim, this was over. I was getting a bit worried because it was in the late afternoon and the sun was slowly vanishing on the horizon and I started to worry picturing us, walking in the dark woods next to our bikes, the gloomy shadows of the trees, the scary sounds of the nocturnal birds and the silence of the night surrounding us like a dark trap. BOO! The power of the mind is funny sometimes, what was magic a few hours before became suddenly scary. I started to feel bad because this was my whole idea, what on earth was wrong with me, we are talking about maybe 23 km and it is not like that we are used to ride our bikes that much. Nasim suddenly quit cold turkey and called her husband to pick her up in the middle of nowhere. There was not enough room in the car for 2 bikes and I felt I had enough energy to go on and reach my home before the night comes. So it was me all alone against the clock haha! As I was riding back to the CBD, I could not help feeling grateful to Nasim for joining me in this crazy but funny bike trip. I felt really happy about the whole day. All in all it was one of the best birthday activities I have ever had 🙂 I liked it despite of its unexpected events: Nasim thought at some point she had broken her bike, a lady advised us to be careful with the Magpie attacks, a guy asked me for the time and I thought he wanted to steal my bag, I scratched my belly climbing in a tree for a scenic picture… and all those km that obviously we were not trained enough for.